Sorry for the long hiatus. I was getting my youngest son enrolled into ABA like his older brother and had various other things going on that left little time for blogging. I have been taking some pics here and there though as I was thinking about my bloggy friends while I was gone. I have been making lots of really simple meals like this one. 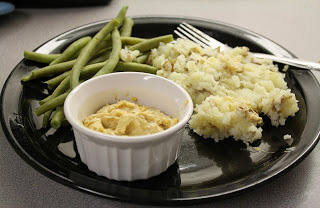 It’s mashed potatoes and green beans with some hummus. The potatoes and green beans are from my last CSA basket which unfortunately I didn’t get a pic of. The basket arrived as we were about to leave for a dr appt so I shoved it into the fridge put everything away quickly and meant to take a pic later but it didn’t happen. The simple meals are inspired by Cathy Fisher. Mine are not as cool as hers but I want to eat more like a lot of the pics she posts on facebook all the time. 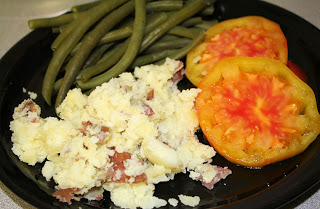 Here’s another similar one I made with mashed red potatoes, green beans, and heirloom tomato slices. 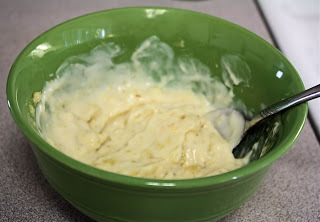 I made this one morning for breafast and it was just ok. It’s soy yogurt with mashed banana and some flax meal. It tasted fine, just nothing exciting. Brown rice noodles with veggies and tofu. This has become a definite favorite around here. I used the lefover tofu the next day and added it to brown rice, veggies, and avocado. 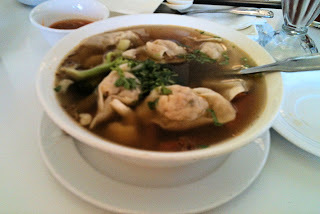 This makes me want more of that tofu right now, so good! This was a one of those thrown together meals when groceries were getting low in the house. It’s brown rice pasta with spagetti sauce and tvp. Also made a watermelon smoothie. It’s just watermelon blended with ice. My youngest son won’t eat watermelon by itself but he loves the juice so he really likes these. Lastly, I have a grocery haul from yesterday. We went to Trader Joes and I picked up a few things from Sprouts. From TJs, I got tofu, corn tortillas, pecans, spinach, mushrooms, sunflower butter, brown rice spaghetti, and a couple fruit leathers. At Spouts, I picked up avocados, hummus, vegan greek yogurt, and brown rice crackers.